Inside the rename dialog in Resharper 5.1, the shortcut for Edit.DeleteToWordStart does nothing, and the typical Ctrl-Backspace does worse than nothing, it makes a little "undefined character" box appear. This is extremely annoying. 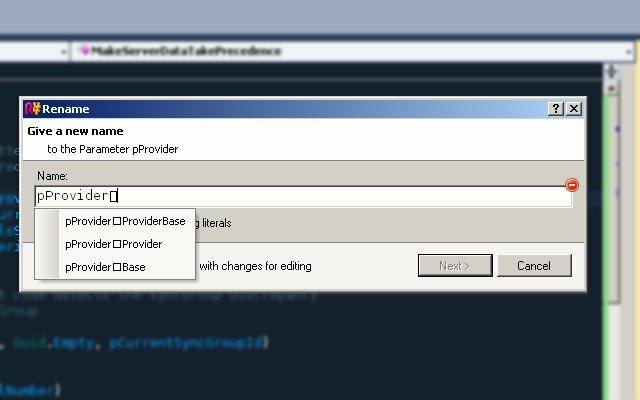 Is it possible to make movement and edit shortcuts work inside the refactor rename dialog? I use an emacs-style set of movement shortcuts, and it is very irritating to have to move my hands down to the arrow keys or mouse just to rename a function, then doubly annoying to re-discover that Ctrl-Backspace doesn't even work, but instead adds characters . I suspect it cannot be fixed without modifying the source, but I thought I would ask. I attached a snapshot of me hitting Ctrl-Backspace again by accident this morning. Image of me shaking my fist in rage not included. appear. This is extremely annoying. this morning. Image of me shaking my fist in rage not included.